Yesterday we went down to Sheffield for the very interesting In the Name of History conference organised by James Chetwood. One of the themes of the day was what type of information historians can get from names that they can’t (easily/necessarily) get from other types of sources. Medieval personal names encode unique data about cultural context that is often available in no other source. This information could function at the individual scale, such as when a tax role from Paris has a l’Anglais and a l’Escot, or a census from Rome has a fiorentina and a todescha. In a documentary context where the only information we are given is a name and either a taxation amount or a number of people in a household, quite often names encode information that would be in no other way accessible. Names can also provide evidence of local phenomenon at a micro scale, at the level of cities or parishes, where the influence of local saint or dignitaries can sometimes be seen. Finally, names can also provide cross-cultural information at a macro scale, such as how languages change and develop, how linguistic fads move, how (and when and where) names and naming pattern propagate. This macro scale can only be studied through massive cross-cultural onomastic corpora. In our talk, we sketched two case studies of the type of things that can be seen from such a cross-cultural corpus, drawn from the data we’ve collected for the Dictionary (both published and unpublished citations): (1) Protestant naming practices in the late 16th C, and (2) the eclipse of Germanic names over the course of the 12th C.
We’ve discussed Protestant names before on the blog, but our point today was to use this data to argue against a conclusion which may seem appropriate when considering the English data alone, but which, in the presence of relevant contemporary French and Dutch data, is no longer warranted. We must at once draw a line between the Reformation and Puritanism. Previous to the Reformation, so far as the Church was concerned, there had been to a certain extent a system of nomenclature. The Reformation abrogated that system, but did not intentionally adopt a new one. Puritanism deliberately supplied a well-weighed and revised scheme (pp. 42-43). If you look at English data — particularly after 1600 — it is certainly true that the Puritans adopted some distinctive names and naming types (“Praisegod”, “Fly-Fornication”, etc.) However, as our previous blog posts have shown, there is a distinctively Protestant trend in given names that can be identified if the French, Dutch, and English data is all analysed together. This cross-cultural analysis is required: Some of the trends that are visible across all three contexts would be merely a handful of isolated incidents if only one cultural context were considered. For example, if we consider New Testament masculine names exclude the names of the apostles, each of the three cultures have only a handful of examples. But when we compare the name lists from each, we see that there is a significant amount of overlap — while no name occurs in all three contexts, almost half occur in two, and not always the same two. From this, it is clear that these individual examples are all a part of a wider trend. 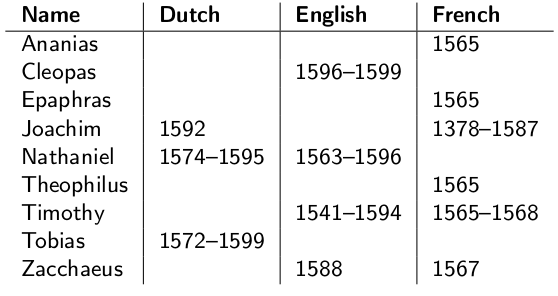 Memorantia and Opportune are both found in Protestant contexts, and are extremely atypical names for the wider Dutch and French naming pools in the 16th C (or earlier). They are best understood as being examples of a Protestant-wide trend towards virtue names, forcing us to look beyond the narrow scope of Puritanism. This is but one case-study of the sorts of trends that you can only witness if you look at a broad set of data. We’ll cover another case-study in a future post! The final place where the influence of distinctly Protestant naming practices can be seen are in virtue names. Virtue names were rare before the 16th C, but from about 1550 on, a wide variety of virtue names, some still in use today, spring up. They were most common in English, but a handful can be found in other languages, as well. Withycombe points to the popularity of virtue names in England as a specifically Puritan — rather than more broadly Protestant — practice: Since the Protestants had co-opted a number of the obscure Biblical names (as we’ve seen in previous posts), those religious zealots who wanted to truly distinguish their child by their names opted for a wholly new category. First, we have the three cardinal virtues: “feith, hope, and charite” (as the Wycliffite Bible of 1395 gives them; though the 1525 Tyndale New Testament has the more usual “fayth hope and love”). Faith is perhaps a quintessentially English name: It is extremely unlikely to be found elsewhere given that its root is Anglo-Norman feid, feit, fait (about which you can read more in the Anglo-Norman Dictionary‘s entry: fei). Hope too is uniquely English, as the modern word derives from Old English hopa (from Proto-Germanic *hupōną, the root of German hoffen (v.) and Dutch hopen (v.)) in contrast with the usual forms on the continent deriving from Latin spes. We do not yet have any examples of the name, but it’s only a matter of time before we do; Bardsley notes a child baptised Hope in 1598 in Cambridge (p. 140). The Old English word for ‘love’, lufu, was a common Anglo-Saxon name, but mostly fell out of use with the Conquest. Instead, it was Charity, deriving from Latin caritas ‘love’, that was used. This name can be found in England as early as 1540, and we have not yet found any examples outside of England. Virtue names can be one of two types: They can either name the virtue itself (as in the three above), or they can ascribe the virtue to the child adjectivally. In general, the nominative forms were more common in England, and when virtue names were used outside of England, adjectival forms tended to be more common. One virtue name that we found outside of clearly Protestant contexts derives from Latin sperantia ‘hopeful’. It was used both by men (Esperance) and by women (Esperanza) in Italy and Spain. 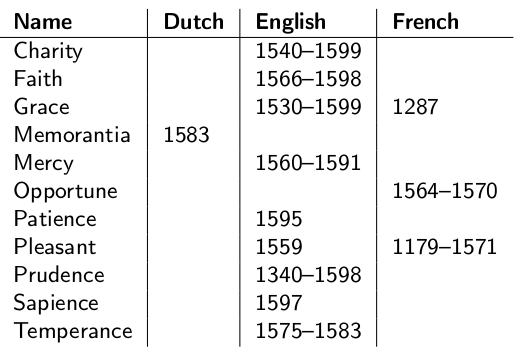 While Grace, like other virtue names, wasn’t used much in England before the 16th C, unlike the others it was used earlier on the continent, showing up in France, Italy, and Portugal as early as the 13th C, and in Spanish not much later. Memorantia, identical to the Latin word for ‘remembering’, is a beautiful and unusual virtue name found in Dutch Protestant contexts. It’s one of the few non-English Protestant virtue names. Mercy: This virtue name came into use in England in the late 16th C (not the 17th C, as Withycombe suggests). Patience: Another virtue name in use in England at the very end of the 16th C, which Withycombe places in the 17th C.
Pleasant: A rare virtue name in 16th C England, this name can occasionally be found much earlier in France. Along with this we might also count as a virtue name the name Savory, from Anglo-Norman sauverré, savure, savré ‘sweet, pleasant, fragrant’. Prudence, from Latin prudentia ‘prudence; discretion; good sense’, is found in both England and in Italy. Sapience is another rare and unusual virtue name; we have found one instance of it in England at the end of the 16th C.
Temperance, another name found only in England so far, was somewhat more common than some of the other virtues. What is curious is that the virtue names are almost exclusively feminine. We suspect this is an accident of data, for certainly there are virtue names that were used by men, but we simply have not yet come across any. We may have to revisit this post in the future after we have! We’re in the home stretch with the Biblical names! In this our final post on this sub-topic of our monthly topic, we look at the New Testament men’s names of Greek and Roman origin. The first batch we can set aside as being unable to tell us anything unique about Protestant naming practices for the same reason we set aside the names of the four evangelists in the previous post: The names of the apostles. Among the apostle names of Greek origin we have we have Andrew, Peter, Philip, and Simon, all of which were popular throughout the Middle Ages across Europe; for similar reasons, the name of the first martyr, Stephen, was also a continual favorite. So, what New Testament names of Greek origin seem to have gained a new popularity in the 16th C? Cleopas: The name of the disciple who encountered Jesus on the road to Emmaus, this name was rarely used in England in the 16th C.
Epaphras (entry still being written): The name of a disciple from Colossae, we have one example of this name from the Protestant Church at Caen in the 16th C.
Theophilus: The name of the person to whom the gospel of Luke and the book of Acts were addressed, we also have a single example of the name from Caen in the 16th C.
Timothy: The name of the recipient of two epistles by Paul, Withycombe and Bardsley differ on the use of this name in England; Withycombe notes that the name didn’t come into use until after the Reformation, while Bardsley includes Timothy in the list of Biblical names in use before the Reformation (p. 36). Further research will allow us to arbitrate this question, but in the meantime, we certainly have clear evidence for the use of the name in 16th C England and 16th C French. Curiously, we don’t (yet) have examples of any of these four names in Dutch Protestant contexts. In this class of names we have Paul, which like the names of the disciples and Stephen, was used throughout medieval Europe. It was never as popular, though, in England, until the 16th C, though it doesn’t show us quite the same spike in usage that some of the other names we’ve discussed have had. Which leaves us with Crescent, the name of a minor character, of which we one example from 16th C England. From this we can see that, yes, amongst the Biblical names that first came into use among Protestants in the second half of the 16th C, there was a special predilection for names of Hebrew origin, but the fad for Biblical names was not exclusive to the Hebraic ones, especially amongst the women’s names. Any minor character was fair game — and we have no doubt that as we continue to collect data, we’ll find both more examples of the names we’ve covered in this series, and new examples of obscure Biblical names. Though we’ve come to the end of the Biblical names, we are not quite done with this series. There is one final class of names which have a right to be called distinctly Protestant names, which we will devote our final postin this series to: Virtue names! The month is nearing the end, but what we have to say about Protestant influences on naming practices in the second half of the 16th C certainly isn’t! The list of men’s names drawn from the New Testament is long enough that we may not get through all of it in one post, but let’s give it a go and see how far we can get. As we did with the woman’s names, we’ll organize these according to linguistic origin — Hebrew, Greek, Roman, and Other — with the exception of two groups of four names. If there’s one group of Biblical names whose popularity was thoroughly entrenched in Christian Europe from a relatively early date, it’s the names of the four Evangelists: Matthew, Mark, Luke, and John. Two of the names are Hebrew in origin, one is Greek, and one is Roman: And all four were enduringly popular. It is hard to say, given our current data, when their popularity dates from, specifically, but there is clear evidence that there was a sea-change in naming practices across Europe in the 12th C: At the beginning of the century, secular Germanic names are still numerous throughout much of continental Europe, while by the end, John in all its variants is clearly beginning to be favored; this century marks the beginning of ascent to the position of “most popular name”, a position it dominated in pretty much every western Christian culture from then until the late 20th C. The names of the other evangelists were never as popular — in comparison, Luke was relatively rare — but the names were equally embraced by Protestants, Catholics, and Puritans alike. Ananias: In our previous post we noted that Ananias was so closely associated with Puritanism in England that it became a cant term, and we also pointed out that both Ananias and his wife Sapphira are surprising choices of people to name your child after. So it is especially interesting that the one example of this name that we have so far isn’t even from English contexts, much less Puritan. Instead, our single example is French. Joachim: This name was both the apocryphal name of the father of Mary as well as the name of a number of minor Old Testament characters, so it could be classified as either a NT or an OT name. Evidence that it was the father of Mary more than the Old Testament characters that influenced the use of this name comes from the surprising lack of examples of this name in the three Protestant contexts that we are particularly interested in. We have no English examples, and only one each in Dutch and French contexts. This name was markedly loss popular than a lot of other otherwise obscure Old Testament names. Nathaniel: The name of one of the disciplines, we find it in 16th C Dutch and English contexts, but it was rare elsewhere and elsewhen (interestingly, hearkening back to our discussion of nicknames, there are a number of 16th C diminutive forms of it in 16th C Estonia). A curious fact about the name: The earlier spelling of the name was Nathanael, more clearly reflecting the Hebrew form, but it was later altered to match the spelling of Daniel. Tobias: Not strictly speaking a New Testament name, this was the name of the main character in the apocryphal Book of Tobit. The name was rare in England before the Reformation, and we have no French examples, but in the 16th C, it was a moderately popular Dutch name (and continues to be so today). All the names we consider under this heading are Aramaic, and two of them were originally nicknames. Bartholomew: The patronymic by which the discipline Nathanael was better known. It is instructive to compare the use of this name with Nathaniel above: While Nathaniel suddenly became significantly more popular in the 16th C, Bartholomew was perennially popular throughout Europe. While it is always extremely tricky to speculate about intentions behind the choice of names, one might be tempted to say that Nathaniel could be seen as a Protestant alternative to the popular Bartholomew. Thomas: Another nickname, meaning ‘twin’, Thomas is one of the few names that can rival John in popularity, in certain data sets at certain times and places, and even when it wasn’t more popular than John, it remains one of the solid choices for a man’s name throughout most of Europe in the Middle Ages. Thaddeus: This name doesn’t fit any of the patterns we’ve seen so far: It’s the name of an apostle, but it was never popular; it was rare pre-Reformation, but does not seem to have become any more popular afterwards. This is another name where only more data collection will allow us to have a better understanding of when, where, and why it was used. This gets us through about half the list, so we’ll pick up the names of Greek and Roman origin in the next post! Withycombe, E.G., The Oxford Dictionary of English Christian Names, 3rd. ed. (Oxford University Press, 1977). Having completed the Old Testament, we now move on to the New Testament. When Bardsley discusses the rise of what he identifies as a specifically Puritan naming system (though we have already begun to argue against this in our first post on the topic), he labels the trend “the Hebrew invasion” , giving the impression that it was names of Hebrew origin, specifically, that were being taken from the Bible. When we look to the New Testament, we see that this is not the case: Plenty of Greek and Aramaic names were first adopted in the second half of the 16th C. Accordingly, we divide the women’s names that we look at into those of Hebrew origin and those not. Anne: This name could be classified as either an Old Testament name or a New Testament name. In the OT, this was the name of the mother of Samuel (more often modernly transliterated as Hannah); in the apocrypha, Anne is usually identified as the mother of Mary, though she is not named explicitly in the NT. Whatever the origin and whatever the spelling, this name was always common; it was, in fact, one of the most common feminine names throughout all of Europe throughout the Middle Ages, due primarily to the early veneration of the mother of Mary. The name was so well entrenched that the Protestant turning away from the veneration of the saints did not cause any reduction in its popularity. Elizabeth: The name of Mary’s cousin, this name, too, was popular throughout the Middle Ages. In England, the popularity of the name was maintained in the latter part of the 16th C, with the reign of Queen Elizabeth I.
Joan: Many people may not realize that this is in fact a Biblical name, the name of a woman healed by Jesus and who later accompanied him as a disciple. She was later venerated as a saint, but it was the use of this name by many medieval queens, in addition to the “Maid of Orleans”, Joan of Arc, that helped the name maintain its place as one of the most popular women’s names throughout history. Martha: This is the first of the names in this post which was not already in common currency by the 16th C. The name was used occasionally throughout Europe, but it shows a sharp increase in use in England and France in the 16th C.
Mary: The name of the mother of Jesus, Mary was one of the earliest adopted of all the Christian names; examples can be found in France as early as the beginning of the 9th C. The same root which gave rise to Mary is also found in the Old Testament, in the name of the sister of Moses, modernly usually spelled Miriam. While the use of Mary cannot be used to differentiate Catholics from Protestants in the 16th C, the single example of Mariam (used as a nominative form, and not to be confused with Mariam, the Latin accusative of Maria) that we have is from England in 1573. Salome: A derivative of the same root as Solomon, Salome is a curious name to be used in any sort of venerative contexts, given that the best-known historical Salome was the cause of the death of John the Baptist. The name was never common, but we do have a single example in Dutch from 1592. The remainder of our NT feminine names are all of non-Hebrew origin. Dorcas: Of Greek origin, Dorcas was used as a translation of Aramaic Tabitha. Both names were used in England in the second half of the 16th C; Tabitha was also used rarely in Dutch contexts. Lois: The name of the grandmother of Timothy, the eponymous character of one of the NT books, her name was occasionally used in England after the Reformation. We have, so far, not found any non-English examples. Lydia (entry available in next edition): Lydia, also spelled Lidia, became common in Dutch contexts in the latter part of the 16th C, but was rare in England before the 17th C.
Magdalene: Magdalene, like Lydia, was originally a locative byname, not a given name, the most famous bearer being Mary Magdalene in the NT. The name was used in German from the 15th C, but otherwise it first reaches predominance in the 16th C, with a huge upswing in popularity in French, Dutch, and English. Phoebe: The name of a minor character in the book of Romans, Withycombe’s earliest instance of Phoebe in England is from 1566 , and our earliest instance in France is from two years later. Priscilla: Our sole example of an NT name with a Latin origin, Priscilla was used by both the English and the Dutch. Sapphira: Like Salome above, the use of Sapphira may be surprising, given the negative light in which she is found in the NT. Bardsley highlights her name, along with that of her husband Ananias, as “New Testament names, whose associations are of evil repute” (pp. 72-73), noting that “Ananias had become so closely associated with Puritanism, that not only did Dryden poke fun at the relationship in the ‘Alchemist’, but Ananias Dulman became the cant term for a long-winded zealot preacher” (p. 73). Despite these unpleasant associations, we’ll see this name again when we discuss the New Testament influence on men’s names, in our next posts. Bardsley, C.W., Curiosities of Puritan Nomenclature (London: Chatto & Windus, 1880). Withycombe, E.G., Oxford Dictionary of English Christian Names, 3rd ed., (Oxford: Oxford University Press, 1977), s.n. Phoebe. In this post we finish up looking at Old Testament names, and whether we can see evidence of correlation between Protestant influence and the use of these names by men in the Middle Ages. You can read part 1 here and part 2 here. Manasses: This name, the name of a patriarch and a king of Judah, seems almost designed to ruin all of our hypotheses. It is a relatively obscure Biblical name, and yet we have no 16th C citations of it (yet). Instead, the name was moderately common in France in the 12th and 13th C, with a few examples earlier and a few examples later. Meshach (entry available in next edition): The second of the three brothers who visited the fiery furnace in the book of Daniel (we saw the first one two posts ago, and the third shows up later in this list), Meshach was spelled Misaac and Mysaac in the Wycliffite Bible of 1395, and the former spelling is also the French spelling; we have one instance of Misaac in Caen in 1563. Mordechai (entry available in next edition): The name of the father of Esther, we have one example of the name in 16th C France. Moses (entry available in next edition): Moses wasn’t unheard of in England before the 16th C, its use amongst non-Jews attributable to the popularity of the story of Moses in medieval mystery plays. But in the 16th C, all our examples come from Protestant contexts, with one exception — a Swedish citation of Moisze in 1582. Was this Moisze a Jew? Was he a Protestant? Neither? Who knows! Nathan: The name of a number of Old Testament characters, we have one example of Nathan in 16th C England. Noah: Bardsley notes (p. 35) that this name was used in England prior to the Reformation as a result of the medieval mystery plays, but we have not yet collected any English examples. The two examples from 16th C Caen clearly reflect the pattern under investigation. Sampson: This name was moderately common in France and English in the 12th C, due in part to the 6th C Welsh Saint Sampson who travelled from Wales to Brittany. After a period of reduced use, the name shows up again at the end of the 16th C.
Samuel: The name of the eponymous character of two OT books, Samuel was quite popular among Jews, and the 12th C examples of the name in England that we have are likely borne by Jews. The name experienced a resurgence in French, Dutch, and English contexts in the 16th C.
Shadrach: The third brother from the fiery furnace, our single example of this name was not identified as such until we researched how the name shows up in early vernacular Bible. In the Wycliffite Bible of 1395, the name is spelled Sidrac, which our identifictation of the 1583 English citation of Sidrack that we have certain. Solomon: The son of King David and author of the Proverbs and some of the Psalms, his name was nearly as popular as his father’s name throughout the Middle Ages; in comparison with other Old Testament names, this name saw a reduction in use in England in the 16th C.
Uriah: The name of a number of minor OT characters, this name was spelled in a variety of ways — Urie, Vrie, and Vrye in the Wycliffite Bible, and Ury, Urye, and Urias (like Josias and Elias that we’ve seen earlier) in 16th C England. Zachary: This name could be treated as either an OT or a NT name, since it shows up in both, the name of a prophet in the former and the father of John the Baptist in the latter. This name was not exclusive to the 16th C, and what is most curious about it is not when and where it was used, but how it was spelled when it was! The early medieval form in England dropped the Z-, leading to Latin spellings such as Acharias and Middle English spellings such as Acris. Not many names have variants at both the beginning and the end of the alphabet! With this we’ve come to the end of our tour of the influence of the Old Testament on men’s names in Protestant contexts. Next up: The New Testament!